"...I was getting ready to make a turn to the left off the bombing run at 9:15 A.M. flak hit the aircraft and blew away the two rear bomb bay doors, part of the right vertical stabilizer, part of the right wingtip (approximately three feet of it), and knocked out the aileron controls and two of the four radio sets. Thank God no one was hurt..."
Pierre Boulle's novel, The Bridge Over The River Kwai, recounts the building of a wooden bridge by prisoners of war who were incarcerated at Kanchanaburi in Thailand. Although Pierre claims this is a fictional work, we believe that better than 90% of it is factual. The prisoners did exist, the camp existed, the bridge existed, the war existed, and the atrocities by the Japanese who forced the prisoners to labor and die at that location on that task were real. Pierre titled his book The Bridge Over The River Kwai; however, since the Thai word for "river" is "Kwai", his title literally reads The Bridge Over The River. The actual name of the river is the Mae Klong. There were two bridges, one wooden and one steel. The wooden bridge which was 100 meters down stream from the steel bridge was built three months prior to the construction of the steel bridge. These bridges, which were located at Kanchanaburi on the rail line between Thanbyuzayat and Bangkok, provided the major supply line used by the Japanese to transport supplies through Thailand and Burma to their troops. It was the job of the 7th Bomb Group, 10th Air Force, based in India, to work on lines of communication and other strategic targets in this theater: In working on the lines of communication, it was our duty to knock out the rail lines, the trestles, the railroad bridges, and the marshaling yards. This rail line and the bridges had been destroyed or disabled numerous times, but they had always been rebuilt or repaired and put back into use. We would bomb them and knock them out again, and they would be rebuilt. The last time the wooden bridge at Kanchanaburi was destroyed was on April 3, 1945, by bombers of the 7th Bomb Group flying out of India. The following is the true story of the destruction of that bridge as viewed through the eyes of the 20 year old Ist Lieutenant who commanded the B-24 Liberator that flew and led that mission. The crew members on aircraft #62, a Liberator of the 436th Bomb Squadron, that flew this mission were Charles F. "Curly" Linamen, Pilot, Ashland, Virginia; Thyron Bradley Hamlett, Co-pilot, Great Falls, Montana; Raymond F. Hanson, Navigator, Livonia, Michigan; William A. Henderson, Bombardier, Gatesville, Texas; William A. Nations, Engineer-Gunner, Greenwood, Mississippi; Bernard K. Bondurant, Radio Operator-Gunner, Chicago, Illinois (deceased 11-16-79); Clifford E. Webb, Armorer-Gunner, Lake Worth, Florida; Herbert Clyde Saylor, Assistant Armorer Gunner, Lancaster, Pennsylvania; George Barrett Twelvetree, Nose Gunner, Auburn, California; and Raymond F. Hertzlin, Tail Gunner, Rush, New York. On April 2, 1945, my crew had been alerted for a mission on April 3rd. After spending most of the afternoon and evening sleeping, we got up around 11 P.M. in order to make the 1:00 A.M. briefing on April 3rd. At briefing we were informed that we would be the lead crew on a mission to the by-pass bridge (wooden bridge) at Kanchanaburi. The official designation of this bridge was Q654. We referred to it as the by-pass bridge at Kanchanaburi. We were briefed to make three runs on the target at 6000 feet and to drop two 1000 pound bombs on each run. We were informed that flak suppression ships would arrive at the target before we did and would drop anti-personnel bombs on the anti-aircraft positions surrounding and protecting the bridge. We took off at 2 A.M., April 3rd and flew a southeasterly course, down over Calcutta, out over the Bay of Bengal, headed towards Thailand. We flew singular ships spaced five to ten minutes apart. We flew southwest of the tip of Burma, and as we got south of Burma, we turned due east and headed toward Thailand. As we were passing the southern tip of Burma, it was dark: There was no moon, and there were very few stars. We were running without any type of navigation lights and flying very low to avoid radar detection when a Japanese fighter aircraft pulled in at 7 o'clock at the same level we were flying, positioned himself about 70 yards out, and flew along with us. My tail gunner notified me of this situation and asked for instructions. I advised Ray to track him, to keep him in the tailgun sights, not to fire; however, if he attempted to point his nose towards us or make a tactical pass at us, Ray was to shoot him down. He flew along in this position for approximately ten minutes and then suddenly veered off to his left, away from us, and headed back toward Burma. We had heard that the Japanese had very poor night vision. Whether this was a fact or not we do not know, but in any event, this particular fighter pilot did not see us or chose to ignore us. Either way, we had managed to get by our first enemy contact on the mission. We continued flying east until we arrived at the coast of Thailand where we proceeded on to Kanchanaburi, arriving before 9:00 in the morning. As the flak suppression ships had not arrived and fuel conservation was a major concern, we decided to proceed immediately with our bomb runs as instructed. At 8:59 A.M. we started our first bomb run on the wooden bridge at 6000 feet. We had to be extremely careful that we didn't drop any bombs beyond the bridge because there was an Allied prisoner of war camp located at the end of the bridge. If we overshot our target, our bombs would land in the camp. As we proceeded on our bomb run everything was normal. The Japanese anti-aircraft guns were firing at us, but the flak was high and to the right at about 2 o'clock. As we made our first run my bombardier, Bill Henderson, lined up on the target, made his first release, and, for some reason, only one bomb went away. It was a direct hit and knocked out one of the major spans of the bridge. The bridge was damaged but was not completely destroyed. We then made a turn to the left, completed a big circle and came back on the bomb run for a second time. During this second run, the anti-craft guns had adjusted their fire and were firing to the right at approximately 2 o'clock; however, they were only about half the distance out and only about half as high above us as they were on the previous run. The bombardier dropped two more bombs which were near misses. We then made another big 360 degree circle to the left and started the third and final bomb run. In the meantime, the Japanese had corrected their errors in firing and now were directly on course at our altitude as we were making the third run, they had us bracketed. As the bombardier dropped the last three bombs (they were very, very near misses), he requested that I hold the aircraft straight and level so that the camera we had mounted in the waist of the aircraft could take pictures of the damage to the bridge. This almost cost us our lives for at the split second that I was getting ready to make a turn to the left off the bombing run at 9:15 A.M. flak hit the aircraft and blew away the two rear bomb bay doors, part of the right vertical stabilizer, part of the right wingtip (approximately three feet of it), and knocked out the aileron controls and two of the four radio sets. Thank God no one was hurt. At the time the aircraft was hit, it made a sharp diving turn to the right just as if #4 engine had been shot out. I immediately applied left rudder and left aileron, pulled back on the control column to stop the plane from diving to the right, and tried to level it out into level flight. I called for a power increase which my co-pilot gave me. The plane had stopped diving and turning to the right, but the right wing was still hanging low. The wings were not level. As soon as I had the increased power I glanced at the tachometers. They were all reading normally. I knew that it was not an engine that was giving us the problem. I immediately rotated the wheel on the control column and realized that I had no aileron control of the aircraft. This is when your stomach drops out. All we could do was compensate momentarily to keep the plane from going down. 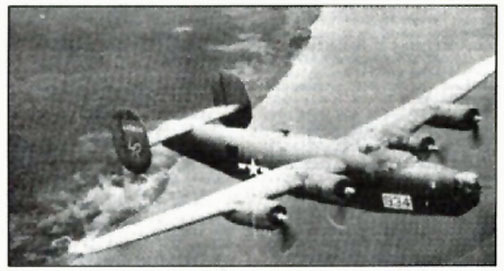 According to aeronautical engineers and designers, the B-24 was not supposed to be able to fly without aileron control. I hit the alarm bell and alerted the crew to a possible bailout. We were just about ready to get out of the aircraft when I realized that we were deep in enemy territory over an enemy target and that we were 1400 to 1500 miles from the nearest Allied base. We were well over 1000 miles from friendly territory. We realized the aircraft was still in the air so we decided that we would try to stay with the aircraft and get it headed toward friendly territory because the further we flew, the closer we would get to home and the less walking we would have to do. It took the ability and teamwork of both the co-pilot and me to effect the recovery of the aircraft. We had lost approximately 4000 feet in the diving turn and our airspeed had increased to approximately 170 MPH. I looked at my directional gyro which also gives me my compass heading and realized that the aircraft again was making a slight turn to the right. I hit the left rudder to stop the aircraft from turning to the right. With the built up airspeed that I had picked up in the diving turn this gave me rudder control, and the wing rolled up level. Through the simple action of trying to stop the aircraft from turning and by the grace of God we accidentally learned how to fly the aircraft in this emergency. We had to stop the aircraft from turning right because that was carrying us deeper into enemy territory. We wanted to turn left and head northwest out of Kanchanaburi towards Cox's Bazaar at Akyab. We had lost altitude in the diving turn, we were in a valley and we had to be at 4000 feet to clear the mountains. We very tediously turned the aircraft to the left and started a slow climb trying to get back two or three thousand feet of altitude. We had to maintain increased power settings so that we could maintain a higher airspeed. If our airspeed dropped below 160 MPH indicated the right wing would drop and we would go into a diving turn to the right. We then had to build up airspeed to regain rudder control. From the time that the aircraft was first hit over the target until we regained control, started our climb out, and headed home was just a matter of seconds. The events that occurred during this emergency happened so fast that words could not begin to keep up with them. This burned more fuel than normal so we had to head to an emergency field. Rather than fly a northwest course which would carry us directly over Thailand and Burma, the majority of which was Japanese held, we decided to turn due west and fly to the Bay of Bengal, out over the water, and go south of Burma towards the Andamen Islands where the Allies had supplies buried for emergencies such as we were experiencing. We felt that if we got to the Andamen Islands, we could bail out or crash land, obtain the supplies stored there, manage to exist until the Allied forces could pick us up and return us to our base. We finally reached the water, proceeded west past the southern tip of Burma, and then headed north by northwest up the Burma coast to Cox's Bazaar which was a British airbase outside Akyab that we used in emergencies. I had used this base on numerous occasions in the past. Although our aircraft was badly damaged and we were using high power settings and burning an excessive amount of fuel, we managed to keep control of it. We decided to fly up the west coast of Burma and try to make Cox's Bazaar. We flew approximately seven and one half hours before we arrived at Cox's Bazaar. We finally managed to get the aircraft up to 6000 feet As we came over Cox's Bazaar, I alerted the crew as to the situation and told them that they were free to bail out if they so desired. At this time, after a few moments of silence, one of the gunners came back on the intercom and asked me what I was going to do - when I said that I was going to ride it down, without hesitation he replied, "what in the hell are we waiting for? ", The faith that crew members have in each other, especially in an emergency situation, is unbelievable. We prepared for our letdown into Cox's Bazaar. At this time there were a lot of ships from our group - B-24's lined up on both sides of the runway, sitting wingtip to wingtip. As I said before, when the aircraft slowed to less than 160 MPH, the right wing would drop and it would go into a diving turn; therefore, the high airspeed had to be maintained so that the rudders would keep the wings level and the aircraft in a straight line. Since there was a good possibility that an attempt to land our crippled bomber on the runway would risk plowing through the line of B-24's, we decided that we would land adjacent to the airbase on the beach on the edge of the Bay of Bengal. I had my radio operator notify the control tower on his liaison set of our intentions as my command set was inoperative. We flew north of the base, made a turn south, set up our landing procedure, and started our letdown. Our indicated airspeed was 170 to 175 MPH, which is much faster than normal but we had to keep that speed so that we could maintain control of the aircraft. As we came over a small inlet all the crew members had taken up their crash landing positions. We came in, rounded out, and everything was working out fine. As we leveled off to set down, a cross wind caught us and started drifting us slightly to the left into some sand dunes. Realizing this, I touched the right rudder which spoiled the airflow over the wings and caused the plane to lose its lift. It stalled out and immediately hit the ground at approximately 155 MPH. The co-pilot quickly shut down all the switches and engines, we pulled the fuel mixture controls back and shut off the gasoline as we proceeded across a wash area where some backwater was held in a hollow in the beach which was approximately 60 yards across and about 3 to 4 feet deep. We hit this, went through it and stopped slightly on the other side of it. With the aircraft stopped, all 10 men came sailing out of it. Out of that crash landing, the tail gunner and the bombardier received minor bruises: No one else was hurt. We lost a brand new aircraft, but the mission was completed, and the Bridge Over the River Kwai was destroyed. To our knowledge the wooden bridge was never rebuilt. 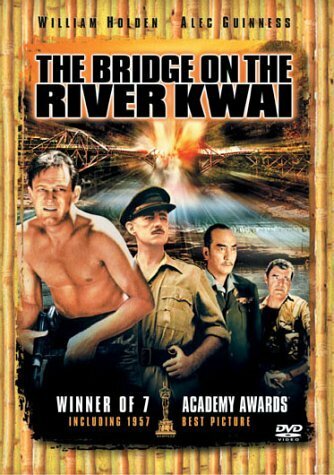 The movie "Bridge Over the River Kwai" was about the famous bridges that were bombed by Charles Linamen's group. The preceeding story was printed in October, 2005 in the magazine entitled: "CBI Roundup" (CBI stands for China, Burma, India). It was written by the pilot, Mr. Charles F. Linamen, in one of the planes dispatched to bomb the bridges over the River Kwai. This story is an account of one of the bomber crews that were assigned to the bomb squadron that Mike Daninger belong to and and worked as a crew chief. The materials depicted on this page were reprinted with kind permission of Mr. Charles F. Linamen. We, at the World War II Stories - In Their Own Words web site wish to offer to Charles F. Linamen our most profound THANK YOU for sharing his memories of his experiences -- during World War II. We will always be grateful for Mr. Linamen's contributions to the war effort and to the countless other men and women who put forth their "finest hour". Original story transcribed from e-mail notations received beginning 14 April 2006. Story added to website 18 June 2006.